along the course of the River Arno. ● The Casentino valley (Valle del Casentino, Valdarno Casentinese) in the province of Arezzo, is formed by the upper course of the river until the confluence with the Maestro della Chiana canal. The Arno arises on Monte Falterona (1654 m) in the extreme north of this basin which is bordered to the east by the Pratomagno massif and to the east by the Tuscan-Emilian Apennines which also form the political boundary between Tuscany and Emilia-Romagna. A bit further south, the Alpe di Catenaia separate the Valle Casentino from the source of the Tiber. In this basin the Arno descends about 1000 m so that the river and all of its tributaries are essentially torrents. ● The Val di Chiana and the Piana di Arezzo were, in ancient times, a tributary of the Tiber. However, this marshy area was drained, beginning in the 18 C with the construction of the Canale Maestro della Chiana by Ferdinando III of Lorraine and his son Leopoldo II which effectively reversed the direction of flow of the water so that the area can now be considered a southerly tributary valley of the Arno even if not strictly speaking a part of the valley of the Arno itself. This basin is bordered to the north by the Pratomagno massif, to the north west by the Chianti hills and to the east by a series of heights that separate it from the Upper Tiber valley (Alpe di Poti, 974 m, Monte Coreta, 742 m, Alta S. Egidio, 1056 m). ● The Basin of the Sieve, is a minor zone formed by the River Sieve, a tributary that flows into the Arno near Pontassieve, immediately before Florence. ● The Piana Fiorentina-Pratese-Pistoiese is the plain including Florence, Sesto Fiorentino, Prato and Pistoia, with the Arno flowing through the middle of it. Even though the Arno is a dominant feature of Florence, in common usage, this plain is not included in the area known as the Valdarno (above). 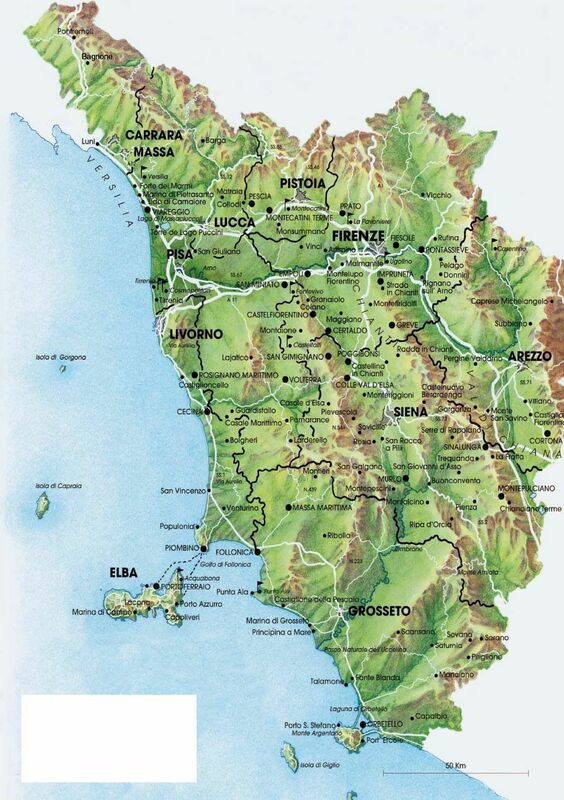 ● The Lower Valdarno (Valdarno Inferiore), is effectively the valley of the Arno between Florence and the sea near Pisa, a valley receiving important tributaries such as the Pesa, Elsa and Era, and via which, after Pontedera, the Arno flows into the Ligurian Sea. The river has a very variable discharge, ranging from minimum values such as 6 m³/s to more than 2,000 m³/s. The mouth of the river was once near Pisa, but is now several kilometers westwards. Click here for a large selection of beautiful farm house vacation rentals in Chianti, plus all you need to know about the Chianti Classico zone of Tuscany.